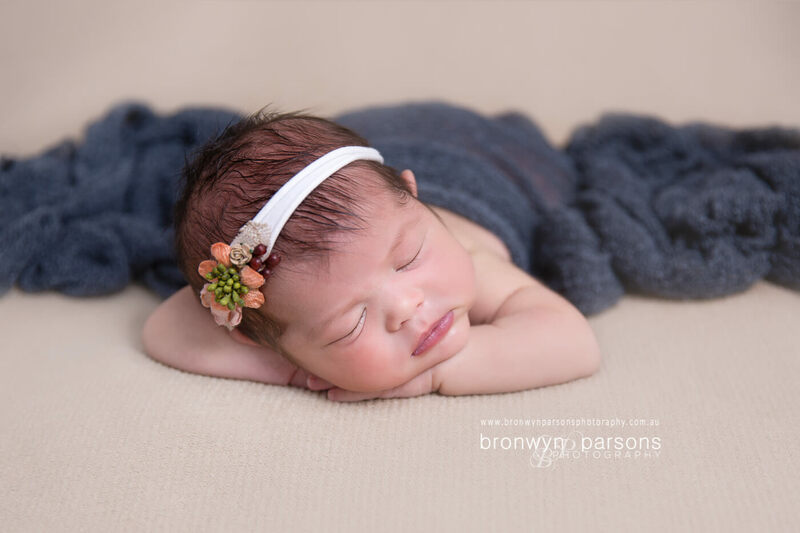 Experience Newborn Photography with Canberra Newborn Photographer Bronwyn Parsons, specializing in Posed Newborn Photography for babies and infants up to 1 month. We pride ourselves on offering clients a warm and welcoming experience coupled with professional photography and beautiful Newborn Portraits. We are a full service business providing Canberra families with something to suit all lifestyles. Sessions are held in our purpose built, dedicated newborn studio located in Kambah A.C.T. Bronwyn Parsons Photography proudly supports Life's Little Treasure's Foundation as a volunteer photographer for the Canberra Walk for Prems Event in support of families with sick and premature babies. We are a professional full service business which means we fully re-touch all images presented, photograph with a finished print in mind and invest much more time with you behind the scenes than just providing a photo session date and photos. We invest a considerable amount of time in planning your session, talking with you throughout the process to personalise your session and ensure you're fully prepared. 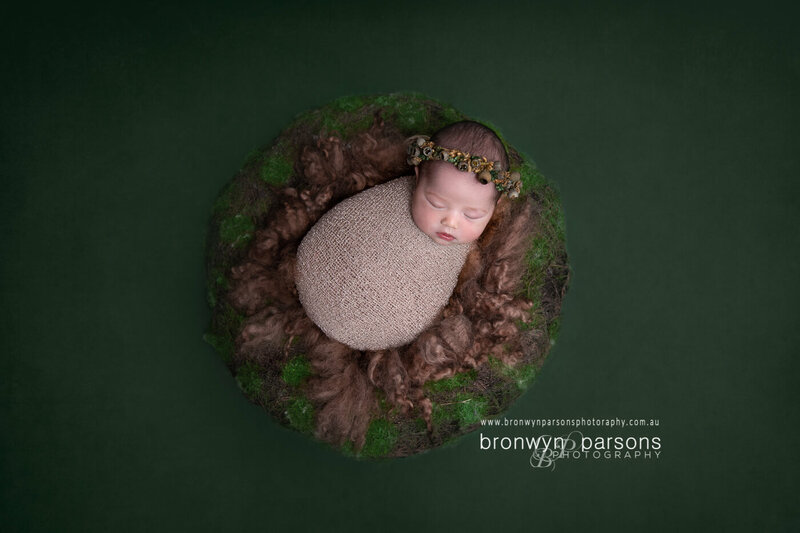 Awarded the babyinfo top ten newborn photographers award in 2018, named by the RiotACT as one of Canberra's top photographers in 2019, we also have a five star rating on google and many many happy client reviews available online to back this up. Our extensive experience in the technical aspects of photography and lighting means you can be confident the images we produce are of a consistently high standard. We care about the little details, about the things that are meaningful to you. We take the time to achieve this pre, during and post-session. We practice composite editing during post-processing to remove hands supporting newborns positioned on an arm, in a parents hands, to create the illusion of suspended slings and baskets, for outdoor and creative edits or in poses that require hands supporting the baby at all times. We've invested time in developing advanced post-processing skills allowing us to undertake specialized newborn skin retouching and produce a custom signature look without the use of actions or automation. We take time to correct common newborn skin conditions post-process including baby acne, newborn skin flakes, uneven skin tones, jaundice and area's where the skin is highly saturated in reds and magenta. Our photographer specializes in newborn photography, we don't use several photographers specializing in other forms of photography. This means you can expect safety, quality and consistency. Our photographer consistently produces amazingly beautiful work that exceeds our clients expectations. Our sessions are baby led. This means you can be confident we will not force your baby into a pose they are not comfortable with, that we will be respectful, gentle, patient and treat each baby with kindness and love. Safety and the comfort of your baby is prioritised above everything else at your session. We follow each baby's lead with what they are and aren't comfortable doing and will never force them into a pose that causes them distress or compromises their safety.. Specific poses require the hands of an assistant to support a baby into position with the end result achieved through advanced composite editing techniques to remove hands post-process. will recommend that siblings do not attend the full duration of a session to enable the photographer to focus entirely on your newborns safety. Posed newborn photography is time sensitive with best posed results achieved in the first 16 days of life and less posed results expected from 16 days onward. We recommend booking in your second trimester to secure availability in our calendar within the optimum window of opportunity for posed newborn photography. When babies are still this fresh we can comfortably sculpt them into the classic posed newborn photography positions you see in our portfolio. Newborns under 16 days are less aware of the continuous micro adjustments made in posing them, are easily settled and are still flexible enough to hold their legs curled up to the chest in fetal position thus keeping them modest when unclothed. This makes the experience much more comfortable for them, gives you the opportunity to pay in installments or even let friends and family know they can contribute to the cost as a gift. We welcome older newborns up to three months with the understanding that our sessions are baby led. The reality of posing an older newborn into the same curly newborn positions as a 16 day old baby significantly decreases with age. Older newborns are more responsive to interrupted sleep during micro-adjustments to position them into a pose, they stretch out rather than curl, general newborn discomforts are well established and they are considerably less settled. For safety reasons, some poses can only be attempted when a baby is deeply relaxed and asleep. Parents of older newborns can expect beautiful awake moments, a larger portion of portraits in props, snug wrapped poses and less curly positions after 16 days. We incorporate the same newborn props and styling into older newborn sessions, adapting the session to your baby's level of alertness, comfort and safety. Newborn sessions start at $490 for digital only and include use of our specialty sourced wraps, blankets, backdrops, hand felted layers, wool layers, prop fillers, hair flowers, bonnets and accessories. Sessions include immediate family (2 adults and up to 3 siblings). All images are individually hand retouched prior to presentation. We also provide a comprehensive session guide, ongoing communication and a pre-session phone consultation. We welcome sibling attendance for the family segment in the last 30 minutes of the session. This is a perfect amount of time to capture the special connection between siblings. We provide a full service experience investing 18 plus hours communicating with you, planning, designing, photographing, hand retouching and delivering your final product. Our studio is kept toasty warm for your baby's comfort with the soothing sound of white noise playing in the background. Our photographer gently removes your baby from it's car capsule and undresses them ready to be photographed. Your baby will be posed into a variety of classic newborn positions working at your baby's own pace to determine which positions they are most comfortable in. We use a special surface specifically designed for newborn posing and adorn your baby with beautiful flowing wraps, hair flowers, beanies and accessories. We will then photograph your newborn in a selection of specialty sourced props and lastly capture newborn images with Mum, Dad and Siblings. Sessions average 3 hours stopping for smaller top up feeds throughout to keep your baby very sleepy, comfortable and settled. Posed newborn photography is a once in a lifetime opportunity in a very small window of opportunity. To assist you prepare and time your booking for best results we've put together some helpful tips for expectant parents. 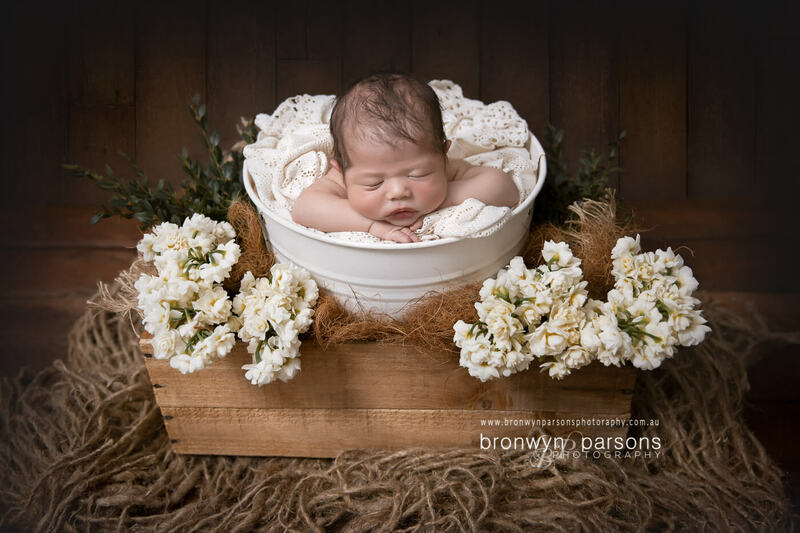 We are one of Canberra’s best affordable newborn photographers. Choose just the essentials, something in between or indulge in the ultimate full service experience. Bronwyn Parsons Photography operates by appointment only. Our calendar typically books in advance and we recommend pre-booking in your second trimester to secure availability in our calendar when your baby arrives. From time to time, we do have last minute openings and welcome you to contact us to be placed on a wait list if you require something last minute. Session Fee: $150. The session fee is payment for the photographer’s time in undertaking work that happens before your session and during the session itself. It does not include any digital or printed products. Prints: Fine art prints with art mounts start at $85. Fine art canvas wall mounts start at $165. Premium metal wall mounts start at $215. Traditional famed fine art wall mounts start at $290. Acrylic wall mounts start at $400. The session fee is due on booking to secure our services. The remaining balance is due on the day of your session. Examples of our work can be found in the video on this page, under the newborn section in our portfolio or on our Facebook page where we post sneak peeks as we are editing client sessions. Our Facebook page is a lovely welcoming community of Canberra parents.